Kingsworth Hostel is located in beautiful Jack's Hill, Kingston, about 10 minutes from the city centre. The Hostel has private rooms only. 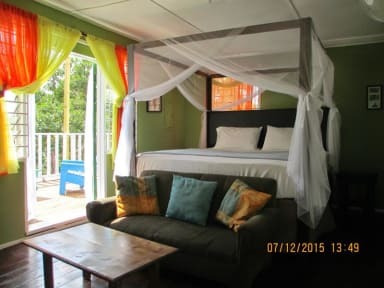 It has a fantastic view of the city with route taxis to take you to the city centre, Bob Marley museum, Devon House and other places of interest. Kingsworth is an excellent choice for visitors, international and local escaping the trappings of high-end hotels and bustling cities and tourist traps for the harmonious serenity of a rural lay back setting. Kingsworth is more homely living accommodations especially tourist looking for a more genuine taste of local lifestyle.The rooms are private, the bathrooms and kitchens are shared. Each room has its entry to bathroom and kitchen. 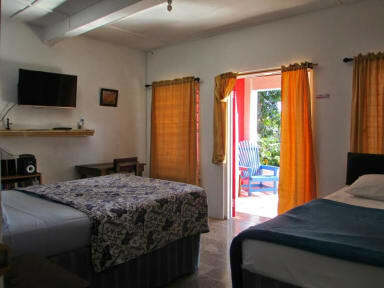 There are five rooms; Love Nest, Orange room, Blue Mountain room, Reggae room and Lib room. Each room has a double size bed, cable tv, free wifi, with the Lib and Reggae rooms having double and twin beds. The house sits on 8 1/2 acres of land. There are many fruit trees throughout the property. Route taxis run all day. Staff is 24 hours. Tours offered are Blue Mountain hike, Blue Mountain Coffee tour and Kingston Music tours. Great Location. View is amazing. Courtney is a great host. Very knowledgeable. Lee was great as a host who went above and beyond; his presence is seminal to the level of service we enjoyed! There were however too many cats which were not controlled and one bathroom which did not have proper ventilation.